Berzocana - Small village surrounded by oak and chestnut woods, streams, a vulture colony, prehistoric paintings, shepherd huts... Situated between Trujillo and Guadalupe. Finca La Sierra is the name of the farm where you can find our house, an old "cortijo" (farmhouse) modified to offer the commodities of three double rooms with private bathroom, very spacious with capacity for 4 or 5 people each room. We have a big sitting-room with fireplace, TV, DVD, HIFI. Rustic decoration. From our terrace, porch and rooms you can delight in great views of the valley of Berzocana - the nearest village - with oak and chestnut woods and a lot of pathways to enjoy the area. Offering bed & breakfast rooms and a self-catering apartment for 2. Fuentes de León is a municipality located in the province of Badajoz, Extremadura, Spain. According to the 2005 census (INE), the municipality has a population of 2674 inhabitants. This countryside hotel in Fuentes de Leon is located to the south of Badajoz, near to Extramadura's monumental cities and nature parks. The hotel offers a restaurant serving a complimentary breakfast every morning, and a coffee shop; the hotel's public areas are air-conditioned. Convento de San Diego, Fuentes de Leon, offers 12 guestrooms, all of which have air conditioning with climate control, showers, and bathtubs. Montanchez - in the middle of three world heritage cities, Merida - Roman capital, Caceres and Trujillo, ancient towns and homes of the conquistadors Cortes and Pizarro. The monastries of Guadalupe and Yuste are close by. 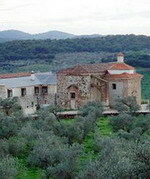 Visit the moorish castle of Montanchez. Finca Al-manzil is an extensive farm on the slopes of the Sierrra de Montanchez a beautiful area which is like going back in time. In the Cortijo, (farmhouse), we have 5 rooms for guests furnished with antiques and original art, a spacious dining room, sitting room and library. All the rooms have private bathrooms and great views. There are terraces and a spring-fed swimming pool. You may walk all over the finca in ancient paths, up to the high peaks and over the sierra to the moorish castle of Montanchez. 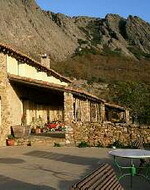 There is a flexible choice of accommodation at the finca on daily or weekly basis. 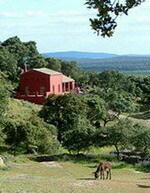 We have three houses, the CORTIJO, the BARN and CASA ALFARERA.